As Moses' sponsor, you will support his education by helping with school fees and other costs that are required for children to attend school in Kenya. We have already covered Moses' school fees for 2016, so we are looking for someone interested in sponsoring Moses next year and for the rest of his schooling. A goal of our student sponsorship program is to create a lasting and positive relationship between you and Moses as he continues his education. We will regularly send you photos and updates on his progress in school, and Moses will send you a letter at the end of each term. We also encourage you to send letters/emails and photos to Moses as often as you would like! Moses is currently finishing up with primary school and has expressed interest in attending a technical school focusing on livestock and agriculture. 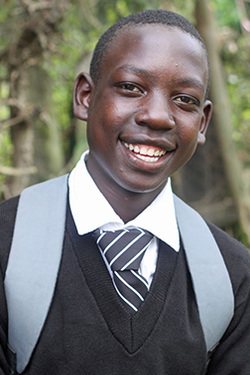 We are currently looking at different schools so we are unsure of the exact cost of sponsorship at this time, but if you are interested in sponsoring Moses we will let you know as soon as he decides which school he would like to attend next year. Please email us at longonoteducationinitiative@gmail.com if you are interested to learn more about sponsoring Moses!